The importance of the precision between the terms “munus” (OFFICE) and “ministerium” (MINISTRY) can not be overstated. The key term that just keeps cropping up is “DEMYTHOLOGIZE”. As in, “demythologize the papacy”. Speak for yourself there, Rudy. ”It was “the least expected step in contemporary Catholicism,” Regoli writes, and yet a possibility [Papal retirement] which Cardinal Ratzinger had already pondered publicly on August 10, 1978 in Munich, in a homily on the occasion of the death of Paul VI. Thirty-five years later, he has not abandoned the Office of Peter — something which would have been entirely impossible for him after his irrevocable acceptance of the office in April 2005. By an act of extraordinary courage, he has instead renewed this office (even against the opinion of well-meaning and undoubtedly competent advisers), and with a final effort he has strengthened it (as I hope). Of course only history will prove this. 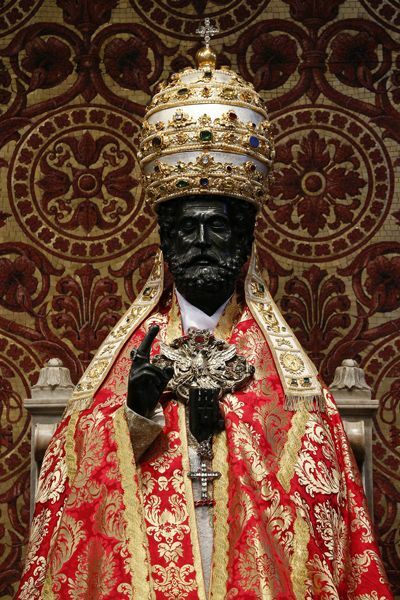 But in the history of the Church it shall remain true that, in the year 2013, the famous theologian on the throne of Peter became history’s first “pope emeritus.” Since then, his role — allow me to repeat it once again — is entirely different from that, for example, of the holy Pope Celestine V, who after his resignation in 1294 would have liked to return to being a hermit, becoming instead a prisoner of his successor, Boniface VIII (to whom today in the Church we owe the establishment of jubilee years). To date, in fact, there has never been a step like that taken by Benedict XVI. So it is not surprising that it has been seen by some as revolutionary, or to the contrary as entirely consistent with the Gospel; while still others see the papacy in this way secularized as never before, and thus more collegial and functional or even simply more human and less sacred. And still others are of the opinion that Benedict XVI, with this step, has almost — speaking in theological and historical-critical terms — demythologized the papacy. That’s the key, right there. That is why the words “munus” and “ministerium” matter so very much. In the context of the Papacy, the OFFICE is DIVINELY INSTITUTED and is protected by a specific and unique SUPERNATURAL GRACE. Now, think about the Antichurch. The Antichurch, by definition is NOT Divinely instituted – it is exactly the opposite, it is set up by satan. Therefore, the Antichurch will contain NO DIVINELY INSTITUTED OFFICES, only man-made “ministries”, including its visible head or heads – its Antipope/s. Pope Benedict XVI went out of his way to say he was NOT resigning the Petrine OFFICE, but only the “active ministry”. +Ganswein confirms this repeatedly and in no uncertain terms above. So, what has happened over the past almost six years, is that the entire world, including the so-called “elect” have become completely desensitized to and even vicious partisans and defenders of the false notion of a “papacy” devoid of any supernatural grace. DEMYTHOLOGIZATION!! In other words, the pump has been totally primed for the full manifestation of the graceless, satanically instituted Antichurch with “even the Elect” merrily skipping into it, and congratulating themselves as they go for their “theological sophistication and dazzlingly humble submission to authority”. Anyone who DARES point out that Antipope Bergoglio CLEARLY, OBVIOUSLY does NOT enjoy the GRACE OF STATE promised by Christ Himself to the Petrine OFFICE, ius divinum, is browbeaten, gaslighted, calumniated – whatever. Every time you read a so-called “Trad Catholic” talking head arguing that Antipope Bergoglio is “in bounds”, “totally within historical precedent” and that “maybe Vatican I was wrong” and that having faith in the supernatural protection and grace of state attached to the PETRINE OFFICE, which, remember, Pope Benedict went out of his way to NOT resign, is some sort of manifestation of stupidity, insanity, affective immaturity or “hyper-Uber-ultramontanism”, realize what is going on. +Fulton Sheen nailed it. Everything in the Antichurch MUST be devoid of Divine content. Including its head/s. But we know that many of the “elect” will be deceived by it. Thus, the “elect” MUST come to accept a thing they wrongly call “the papacy” that is totally devoid of supernatural grace, and not only that, but ACTIVELY REJECT THE TRUE POPE. Now, to news that broke just the other day: Antipope Bergoglio is looking to dissolve the Papal Household/Papal Court. Of course he is. Because this is all part of the satanic pogrom of trying to convince the world that the PETRINE OFFICE, a DIVINELY INSTITUTED AND SUPERNATURALLY PROTECTED MONARCHICAL OFFICE no longer exists. Only a “synodal ministry”. Except it does exist, and will continue to exist. No matter what they try to do. This entry was posted in Uncategorized on January 14, ARSH 2019 by Ann Barnhardt.